← New Moon in Aquarius and A Vision For Change! Ritual Pathworking: Lighting Our Torch! All Hail, Columbia! This pathworking is an experiential rendition of a live ritual held on January 29.2017 at 3:00p.m. (EST) in Springfield, PA. Our coven had decided that we would use the celebration of Imbolc, normally held at this time of the year and dedicate it to the Goddess, Columbia and a self-empowering call to Liberty, Justice and Right Action. These are attributes that are needed more than ever as we move through this year of historical change and uncertainty about the outcomes. The steps we choose to take and the truths that we claim as our own will likely change as the deeper processes of politics, emotions and action are revealed. So it is in the best interest of each individual to connect with the philosophies that our country was founded upon, the realities that our Ancestors encountered and the vision of our Forefathers. This is not the first that America has had to take a closer look at what has worked in the past and what is the vision of the future that every American holds for their place in the broader community of global humanity. This ritual holds the intention of claiming the sword of justice and the light of freedom as we step into the place and power of taking responsibility for our own actions that will ultimately impact those around us. Liberty, as Columbia in the National Statuary Hall in Washington, D.C. Her work is that of Governance and those who abide in her state, the District of Columbia were charged with being committed to the well-being of the country and its inhabitants. Her statue was first put on top of the Capitol building and decree was passed that no building could be higher than that of the head of the Goddess. 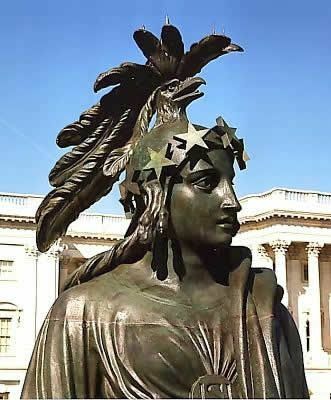 The bronze Statue of Freedom by Thomas Crawford is the crowning feature of the dome of the United States Capitol. 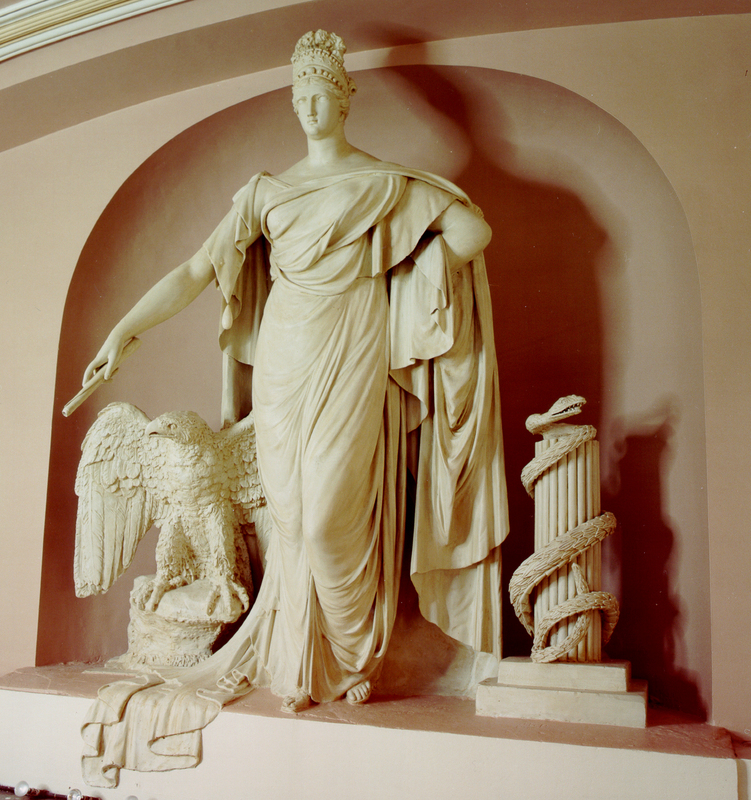 The statue is a classical female figure of Freedom wearing flowing draperies. 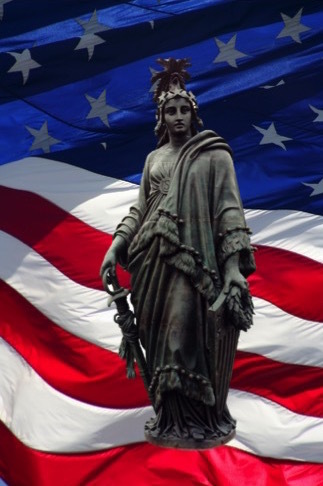 Her right hand rests upon the hilt of a sheathed sword; her left holds a laurel wreath of victory and the shield of the United States with thirteen stripes. Her helmet is encircled by stars and features a crest composed of an eagle’s head, feathers, & talons, a reference to the costume of Native Americans. You will also find her in front of every Federal building in different forms and carrying different symbols. This pathworking will be a combination of active participation and contemplative space. Select a space where you will not be disturbed for approx. 50 minutes and have some room to move a bit. If you are tight on space, movement can be generated by swaying in place. If you wish to gather a small group to work the ritual, be sure each person has a candle for themselves. (optional) If you wish to set-up quarter altars as well as the central listed below, please do so and decorate in whatever way is in accord with your spiritual path. Purification supplies such as incense (or a favorite body oil) and charged salt water (place a small amount of salt in a small bowl of water. Hold the bowl in your hands -one on the bottom, the other hovering over the top. Pull up the energy of intention and connection to what the elements of Earth and Water mean to you. Pour that intention into the now, charged, water of purification). White pillar candle ( I like to use the glass pillars that are sold at the Dollar Store. They are easily contained, burn well and for these purposes actually resemble a torch!). A table or space that will serve as an altar to hold your candle/matches(or lighter) and anything you may wish to add as representation of your affinity with our country, the Goddess Columbia and action. Click Here: Lighting the Torch! All Hail, Columbia! Please Note: you will be directed to the Teachings on the Path web page for this pathworking. Space and media limits on this page do not accommodate this audio. This entry was posted in Bonus Material and tagged Columbia, Pathworking, Ritual. Bookmark the permalink. 2 Responses to Ritual Pathworking: Lighting Our Torch! All Hail, Columbia!